Downstream: Reflections on Brook Trout, Fly Fishing, and the Waters of Appalachia is a mosaic combining nature writing, fly-fishing narrative, memoir, and philosophical and spiritual inquiry. Fly-fishing narratives and fragments of memoir provide the narrative arc for exploring relationships between humans and rivers, and the ways in which our attitudes and philosophies impact our practices and the waters we depend on for life. The authors guide their readers on a journey from Maine's Androscoggin watershed--once one of the ten filthiest rivers in the United States and now home to some of the best wild brook trout fishing in the United States--southward through Kentucky into Tennessee and North Carolina, where a native southern strain of brook trout struggles to survive. Like the rivers themselves, the chapters alternate between flowing narratives and the stiller waters that settle out above dams. While each stone in this mosaic is worth a close look in its own right, seen from a distance the book offers a broader picture of the cold mountain waters of Appalachia and their famous native fish: the brook trout. ""Downstream is an immersion (almost literally) in the streams and rivers of Appalachia in the company of two university professors, friends who through the years have developed both competence and knowledge in fly fishing. From its early pages I was riveted. Their language is exuberant but also disciplined. It didn't take me long to know that it would soon take its place on my bookshelf alongside John Muir and Henry David Thoreau. They are that good."" --Eugene H. Peterson, Regent College, Vancouver, BC, Canada ""O'Hara and Dickerson remind us that a fly fisher must think like a trout--then they lead us on a rugged and beautiful adventure through an ever-expanding 'riparian cosmos.' Downstream radiates out from Manitou's brookie into seamlessly shifting currents of ecology, philosophy, biology, personal history, engineering, natural history, theology, and management until we don't know where the human perspective begins and the brook trout's ends. They present a universe both stunning in its magnificence and terrifying in its fragility."" 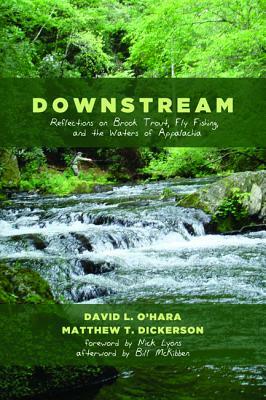 --Andrea Knutson, Oakland University, Rochester, MI ""O'Hara and Dickerson embark on an angler's quest for the fragile but resilient Appalachian brook trout, from the brawling rivers of Maine to tiny Smoky Mountain headwaters in Tennessee. But their journey reveals much more than that, about why we seek the places that trout live--the rivers and streams that allow us to know ourselves and find our way. This book is the vessel for a philosophy that celebrates nature, place, family, and home."" --Kurt D. Fausch, Colorado State University, Fort Collins, CO ""This book traces and enacts the intricacies of confluence within the Appalachian chain's fissured topography. Just as the rich terminology related to aquatic invertebrates, the life cycle of trout, and fly-tying gathers into a larger ecological, geological, and social vision, so too the distinctive voices of these two fine writers join in a moving dialogue on friendship and family, literature and the land."" --John Elder, Middlebury College, Middlebury, VT David O'Hara is an Associate Professor of Philosophy and Classics, and directs the Philosophy program at Augustana College (South Dakota) where he teaches courses in environmental philosophy, ecology and deliberate living, and an annual course in tropical ecology in Guatemala and Belize. In addition to numerous book chapters, he has written for the Chronicle of Higher Education, Books and Culture, and Orion. Matthew Dickerson is a professor at Middlebury College (Vermont) where he has taught essay-writing courses on nature and ecology and on the literature of fishing. His other books include The Rood and the Torc (an historical novel), A Hobbit Journey (on the writings of J. R. R. Tolkien), and two other narratives about fly fishing, trout, and ecology: A Tale of Three Rivers.